You can choose the poem as shown or enter your own wording. Let me know what you would like. Character Limit is 58. If you have any problems with entering your information please contact me. You’ve reached the limit! Use 58 characters or less. This item is made to order. 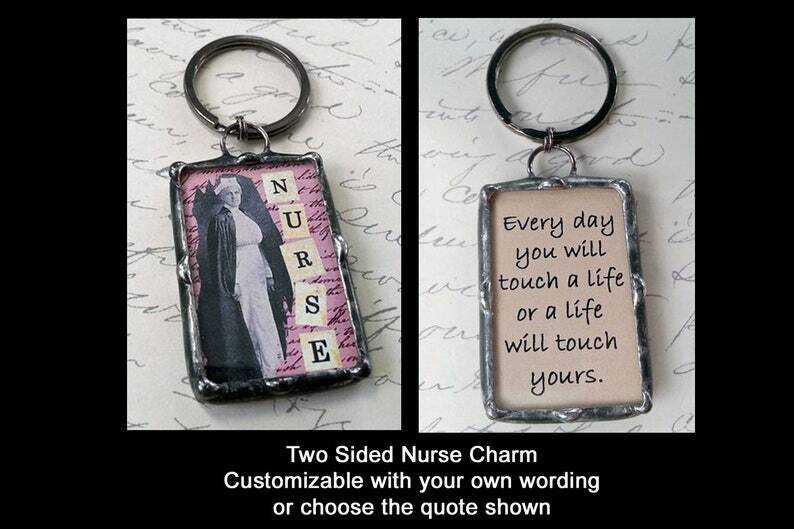 It would be a lovely gift for that nurse in your life! How about for someone who is graduating from Nursing school or someone who has cared for a loved one? Nurses are special people and need to be recognized! The charm measures 1" x 1 1/2". It features a vintage image of a nurse on the front with a lovely pale pink background and a beautiful quote on the back. I applied a dark patina for a more antiqued look. You can choose at checkout what you would like it on. It is shown on a keychain but I can also put it on a neck chain or a corded key fob necklace.